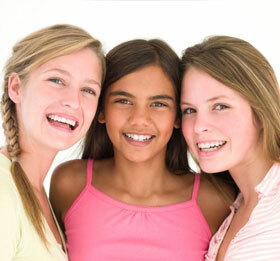 For parents, it’s not always easy to know if a child may need orthodontic treatment. Don’t worry! Braces aren’t nearly as scary as you might think. In fact, braces today come in a variety of styles, materials, and colors, making life with braces much easier, more comfortable, and even more stylish than in the past. What needs correction — The amount of treatment needed to correct a problem will determine how long the process takes. Different patients react to treatments differently; while it may take one patient only 12 months to complete the treatment, another patient may take 24 months. Treatment times can vary, depending on how quickly your body responds and how much work is needed to give you the show-stopping smile you expect. You’ve probably heard from your parents, friends, and even your orthodontist abut the long list of foods and beverages you should avoid while wearing braces. While it may seem like you’re giving up a lot, it is important to avoid eating certain foods. We also want you to enjoy your braces experience, so here’s a quick list of foods to avoid and foods to embrace while wearing braces.